We are not aware of the vast amounts of nervous system activity that occur below the brain’s level of consciousness. Such activity is mainly the province of the ANS (along with the enteric division, which controls most of the abdominal organs, chiefly the stomach and intestines). 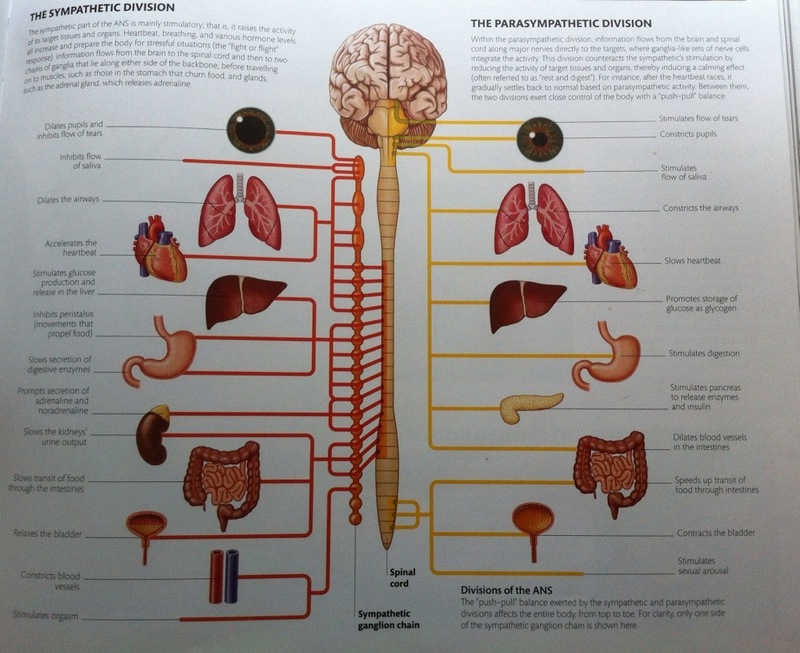 We can think of the ANS (Autonomic Nervous System) as our “automatic pilot”. It monitors internal conditions such as temperature and the levels of chemical substances and keeps these within narrow limits; it also controls processes we rarely think about such as heart rate, breathing, digestion,and excretion, by stimulating muscles to contract and glands to release their products. There are two divisions – the sympathetic and the parasympathetic – of the ANS, the complementary actions if which are shown below. When overwhelming emotions such as sudden grief sweep through the body, this is mainly the result of ANS activity. It takes time and mental effort for the brain to reassert conscious control. The information above is sourced from Dr Alice Roberts “The Complete Human Body” book.